Defense attorneys representing Gov. Rick Perry said Monday that there was nothing illegal or inappropriate about his veto of funding for the state's public integrity unit after Travis County DA Rosemary Lehmberg refused to resign. Three days after he got indicted on corruption charges, Gov. Rick Perry rolled out a high-powered defense team that slammed the prosecution as outrageous and political — but left a lot of answered questions. Included on the team is Ben Ginsberg, the veteran Republican lawyer who represented George W. Bush during the Florida recount battle in 2000; Bobby Burchfield, a leading GOP attorney who has successfully fought federal limits on political donations; former Texas Supreme Court Justice Tom Phillips; and Austin defense lawyer David Botsford. 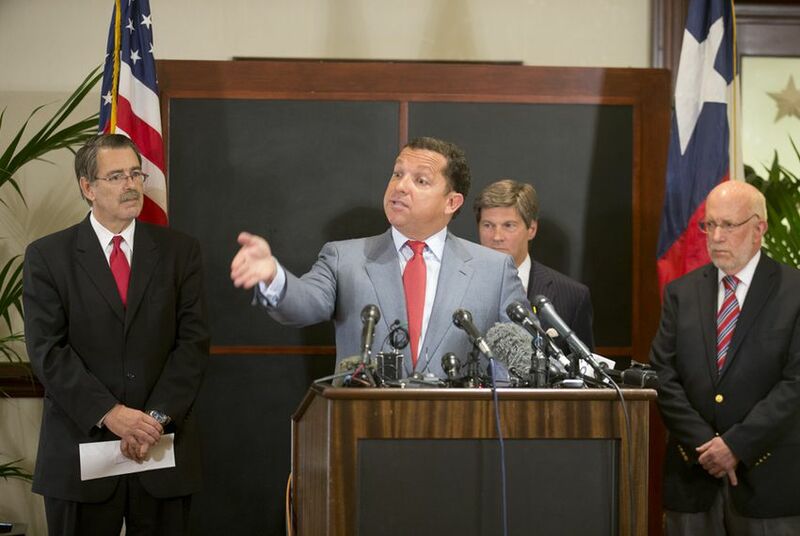 Leading the team is Houston trial lawyer and Texas A&M University Regent Tony Buzbee, a major donor to Perry and Attorney General Greg Abbott. At a news conference Monday at Austin's InterContinental Stephen F. Austin Hotel, Buzbee called the indictments an “outrageous assault on the rule of law’’ and predicted Perry would be exonerated of all charges. A special prosecutor announced Friday that Perry had been indicted by a grand jury on two charges: abuse of official capacity, which carries a five- to 99-year prison sentence, and coercion of a public servant, which is punishable by two to 10 years in prison. The charges stem from Perry’s decision to veto state funding for the public integrity unit, overseen by Travis County District Attorney Rosemary Lehmberg, who refused to resign after pleading guilty to drunken driving charges last spring. Perry’s defense team described the indictment as “dangerous” and unprecedented, saying it was an attempt to “criminalize politics” by Perry’s detractors. The lawyers said Perry had an unfettered right to veto the $7.5 million in funding, and at the news conference, they played the scandalous video of her booking to underscore how badly she had misbehaved after her arrest. But key questions remained unanswered after the lawyers left the room, including who would be picking up the tab for Perry’s new legal team. According to published reports, the state has already paid about $80,000 to Botsford, who had been leading the defense team until Buzbee and the other attorneys were brought in. Buzbee said the team was put together before deciding “which of these lawyers will be paid by the state of Texas and which will be paid from other funds, whether it be a defense fund or whatnot.” Abbott, who is running for governor, has been asked to issue an attorney general’s opinion about whether spending state funds on Perry’s outside lawyers is legal. There was another question from a reporter that hit on one of a central but unsubstantiated allegation from Texas Democrats: that Perry vetoed the money in order to interfere with the public integrity unit's highly publicized and potentially embarrassing investigation of state cancer research grants, including allegations that Perry donors got preferential treatment. That investigation ultimately produced an indictment. On the subject of such an “ulterior motive,” Buzbee said his team had not seen “any proof of that whatsoever.” Likewise, Botsford told reporters that there was “absolutely no motive that I’m aware of” — other than the one Perry publicly stated. Still, even the question of what Perry actually did publicly state before vetoing the money remained unclear after the press conference. Much of what happened took place behind closed doors, and would presumably be brought to light in a prosecution if it goes forward. While news reports and government officials last year said Perry would veto the money unless Lehmberg quit, there appears to be no such statement attributed directly to the governor before the threat was carried out. That point was brought home by Buzbee at the news conference Monday. “Although it’s been reported that the governor stated his intention to veto the bill if she did not resign, I’m not sure if there is any evidence of that other than a newspaper article,” Buzbee said. Buzbee said that there would be nothing illegal about it if he did. The Austin American-Statesman was the first outlet to break the story on June 14, but it did not quote Perry directly. And in statements leading up to the veto, the governor railed against Lehmberg but did not directly say he would cut off the public integrity funds if she didn’t step aside. Lehmberg would have been replaced by a Perry appointee — although there was a behind-the scenes effort to find a solution that would be palatable to Travis County Democrats. Making matters even muddier is that Perry seemed to suggest Saturday — a day after he was indicted — that he did publicly tie the veto threat to Lehmberg’s resignation before pulling the trigger on it. “I very clearly and very publicly said that as long as that individual is running that agency, I have lost confidence in her, the public had lost confidence in her, and I did what every governor has done for decades, which was make a decision about whether or not it was proper for state money to go to that agency and I vetoed it,’’ Perry said. One thing that the legal team did clarify: Perry will turn himself into authorities, and when he does he won’t try to evade reporters. Media outlets were camped out Monday at the Travis County Jail waiting for the governor to show up.